Creating a new blog is very easy if you would like to start a new blog then you can just do it in 5 minutes you can start a blog even on your mobile phone because there is not any need of a PC to start a blog in this article I will explain that "how can you create a new blog for free and make money" with your blog. 1. Go to blogger and login into your account using Gmail address. 2. Click create a blog and choose some domain name for your blog. 3. Enter your blog title and description then continue. 4. Write your first post by clicking on new post. 5. Submit your blog to Google Webmaster for getting visitor from search engine. 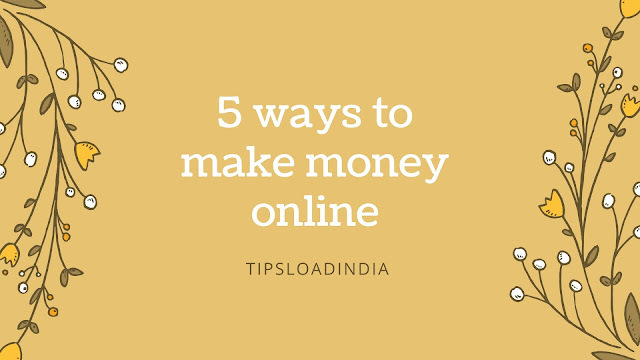 Blogging is now leading profession in all over the world and if you are looking for some ways to make money through blogging then you are at the right place here I will give you some tips which can be very useful to make money through your new blog. • affiliate marketing disable popular way to make money through your blog if you have sufficient visitor Count on your new blog then affiliate marketing can make you rich enough because with this you can convert your visitor into customer for eCommerce websites and they will give you commission on every purchased item from their Store. • Google AdSense advertising is also very well known way to make money through blogging for free with Google AdSense you can place high-quality advertisements on your content. Where is large number of advertisers on Google AdSense would like to place advertisements on account and so try to get Google AdSense approval for make money through your blog. • If you are running a blog regarding Gadgets and devices then selling online products is very good way to make money through your blog because there is a large market of such things just add your referral link in a blog and make money with a blog for free. Making a blog for free is very easy if you have passion about this, blogging is a true profession if you are dedicated into your blog, to create a new blog for free you just have to follow these simple steps. At first you have to choose a blogging platform where you can write your blog articles, their are a lot of websites are available for this work for example WordPress, medium, blogger, and many others. But if you want to start it for free than blogger is best blogging website in my suggestions. After choosing a blog site you have to register on that website using your gmail address this is very simple to create a account on any blogging website we just need a password and a Gmail website to start a new blog. Now you have to choose a domain name of your new blog if you have a third party domain then you can also use that domain in this process after choosing a domain name just add your blog title and choose a theme. After these 3 simple steps your blog is ready to write your first article you can easily write your articles using new post tab at the homepage. You can easily analysis your blog visitors count using and advance future into blogger this isn't real time analysis of your blog visitors you can also see traffic geographical location to improve your content targeting.